RAPAPORT... 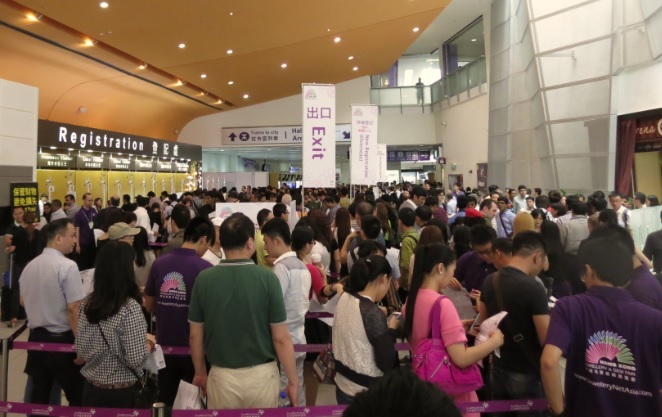 The mood among diamond suppliers who are exhibiting at the Hong Kong Jewellery & Gem Fair improved on the second day of the show due to strong visitor traffic. While trading did remain slightly subdued, suppliers still expressed hope that the large number of inquiries made during the first two days of the show will ultimately convert to solid sales before the loose diamond section of the exhibition closes on Friday. Exhibitors noted that buyers continued to focus on individual stone orders and have avoided making larger volume purchases that would otherwise build inventory. As was the case on the first day, buyers continued to gather feedback on price direction, sensing that manufacturers and dealers are under pressure due to tight liquidity. Suppliers reported that while prices have softened slightly, there was not a significant drop that some feared might materialize. As a result, and given visitor foot traffic, diamond traders said the show was better than expected, so far. Some feedback from manufacturers indicated steady demand for goods up to 2 carats, while buyers are pushing for lower prices in 2-carat and larger goods. Many suggested that there is a higher level of inventory of 1-carat and larger goods on the market since the Gemological Institute of America (GIA) reduced its grading turnaround time for those categories, which has contributed to softer pricing. While sentiment improved, exhibitors are still waiting for a significant push from buyers at the show and expect this may happen on Wednesday across the diamond hall. The jewelry exhibition opens at the Hong Kong Convention & Exhibition Center on Wednesday, so diamond traders expect retail buyers will shift their focus toward the finished jewelry exhibit.